2016 - "Beauty", a life size steel horse made for Simon Properties for their Woodbury Common Premium Outlets in New York. Done in an abstract way, the thoroughbred with his energy shows great strength and poise. The 10' sculpture is all hand forged, shaped and welded. Feel free to browse through this site and above all, TAKE YOUR TIME. Deciding what to do will come from understanding how to reach the goal together. My studio works with bronze, steel and stainless steel. Occasionally using several metals together to achieve specific goals. If you don't see what you are looking for or just have a question, I'm here to help. Whether it be wine cellar dragons, garden statuary, in home furnishings or custom railings, I've done a lot of projects over the years and I can help with yours. 2016 - Beauty, a life size steel horse made for Simon Properties for their Woodbury Common Premium Outlets in New York. Done in an abstract way, the thoroughbred with his energy shows great strength and poise. 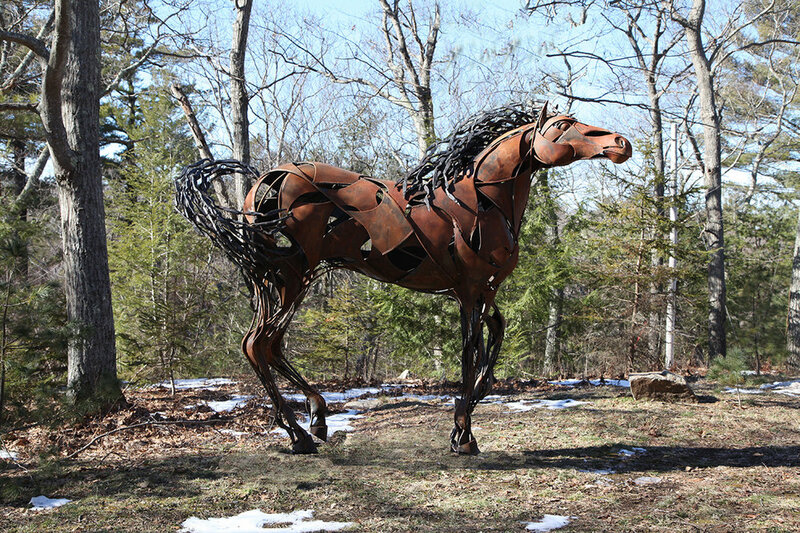 The 10' sculpture is all hand forged, shaped and welded.